↑ Կարլ Բոյեր, «Եվրոպան միջին դարերում» էջ 258։ ISBN 0-471-54397-7։ "Էվկլիդեսի մաթեմատիկական թեորեմաներում Տարրեր VII-IX, թվերը ներկայացված էին հատվածներով, որոնց կցված էին տառեր և Ալ-Խորեզմիի երկրաչափական ապացույցներում Հանրահաշիվը տառային դիագրամներ էին օգտագործված։ "
If we think primarily of matter of notations, Diophantus has good claim to be known as the 'father of algebra', but in terms of motivation and concept, the claim is less appropriate. The Arithmetica is not a systematic exposition of the algebraic operations, or of algebraic functions or of the solution of algebraic equations. ↑ S Gandz, The sources of al-Khwarizmi’s algebra, Osiris, i (1936), 263–277. "In a sense, al-Khwarizmi is more entitled to be called "the father of algebra" than Diophantus because al-Khwarizmi is the first to teach algebra in an elementary form and for its own sake, Diophantus is primarily concerned with the theory of numbers." ↑ (Boyer 1991, "The Arabic Hegemony" p. 229) "It is not certain just what the terms al-jabr and muqabalah mean, but the usual interpretation is similar to that implied in the translation above. 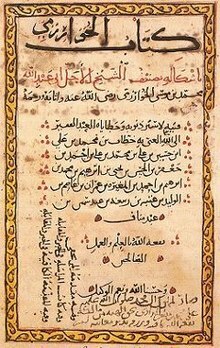 The word al-jabr presumably meant something like "restoration" or "completion" and seems to refer to the transposition of subtracted terms to the other side of an equation; the word muqabalah is said to refer to "reduction" or "balancing" – that is, the cancellation of like terms on opposite sides of the equation." ↑ (Boyer 1991, "The Arabic Hegemony" p. 230) "The six cases of equations given above exhaust all possibilities for linear and quadratic equations having positive root. So systematic and exhaustive was al-Khwarizmi's exposition that his readers must have had little difficulty in mastering the solutions." ↑ Gandz and Saloman (1936), The sources of al-Khwarizmi's algebra, Osiris i, pp. 263–277: "In a sense, Khwarizmi is more entitled to be called "the father of algebra" than Diophantus because Khwarizmi is the first to teach algebra in an elementary form and for its own sake, Diophantus is primarily concerned with the theory of numbers". ↑ (Boyer 1991, "The Arabic Hegemony" p. 239) "Abu'l Wefa was a capable algebraist as well as a trigonometer. ... His successor al-Karkhi evidently used this translation to become an Arabic disciple of Diophantus – but without Diophantine analysis! ... In particular, to al-Karkhi is attributed the first numerical solution of equations of the form ax2n + bxn = c (only equations with positive roots were considered),"
↑ "The Origins of Abstract Algebra". University of Hawaii Mathematics Department. ↑ "The Collected Mathematical Papers".Cambridge University Press.